I thought I'd jump right in to SCAVENGER HUNT, hosted by Carrie at View of You Photography. The theme is Macro, one of my favorite things. 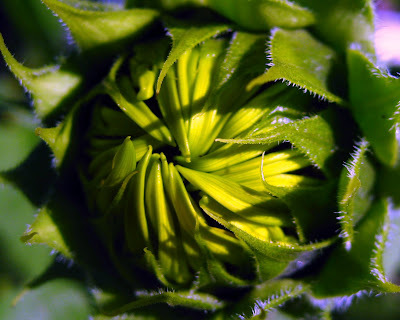 This is a sunflower bud in my garden, taken this week. I love the fuzzy "hairs" on the leaves. I'm not to technical, so hairs will have to do. I like the way Sunflowers look before they open. Take another one tomorrow or the next day, just when the color starts to show. Great macro shot Jan! Thanks for joining in the Scavenger Hunt fun! It is always great to see others perspective on misc. subjects. I will put you on the list of Hunters on my blog with a link to your blog so others can visit and enjoy you photos!